I went to check out an old barn that someone recommended for one of our camera club photo shoots. I'll be returning there with the club on Sunday. Wow- I just noticed this is my 3000th post on 365!! This is a lovely shot and I really like the processing. Congrats on your 3000 photo, Ann! Wonderful capture and colours Congratulations on your 3000 post. I do love o,d red barns. Lovely warm tones. Congrats on 3000 photos! Lovely barn shot in a natural setting. Go you on 3000! Great colors and processing! This is a wonderful image ...very nice color and texture! Fav! Congratulations on your 3,000 photos; that is quite an accomplishment! Fav Very much like a Currier and Ives! Really nice shot & edit. Congratulations on your 3000 th post - amazing achievement! 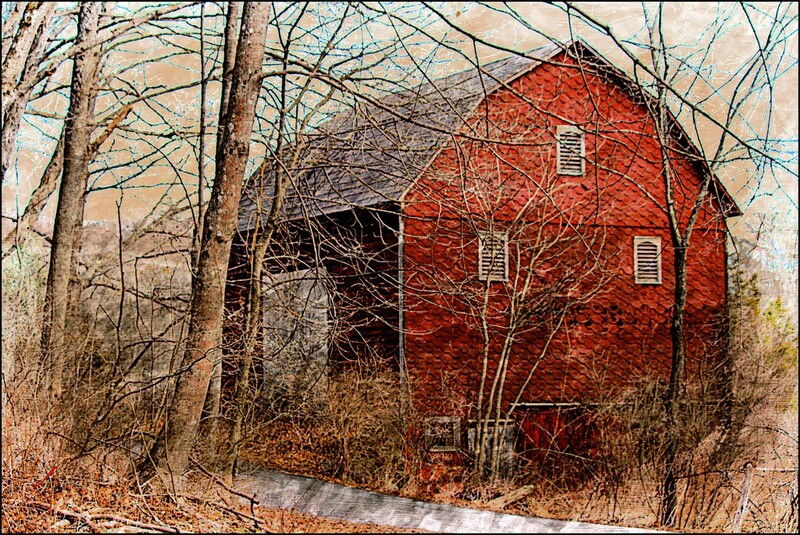 A great shot (and editing) of this nice barn. Those towers are also an advertisment of the water compagny. Thank you, Thank you, Thank you x 1,000 for putting #3000 on both the TP and PP! It's easy to reach that number when you have such great support from folks like you! Gorgeous. I'd love to have this hanging on my wall. @randystreat Thank you Kathy! What size print do you want? @olivetreeann I have yet to put any pictures on the wall of this new house. I look at the pristine walls and think...not yet. But I appreciate the offer. @randystreat I am actually thinking of printing it for an upcoming exhibition. I'd just be sending you the print when it's done- framing and matting will have to be done by you. So if you would like it, I'd be happy to print it in the size you'd like. @olivetreeann I probably wouldn't want anything bigger than 8X10 but would be proud to receive it in any size. @randystreat That sounds good- an 8x10 it is! Beautiful colors and processing. Fav. Congrats on 3000 photos. @eudora Thank you Diane! I usually miss those milestones but I just happened to look at the number and was surprised to see how many I've posted through the years! @randystreat I'm very happy to send it to you! Tickles me pink to think my picture will end up hanging up in another 365 home! @bkbinthecity Thank you Brian! And to think I wasn't sure if I'd make it to the first 365!